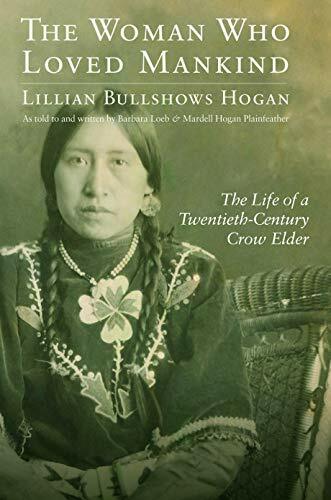 The oldest living Crow at the dawn of the twenty-first century, Lillian Bullshows Hogan (1905&#x2013;2003) grew up on the Crow reservation in rural Montana. In<i>The Woman Who Loved Mankind</i> she enthralls readers with her own long and remarkable life and the stories of her parents, part of the last generation of Crow born to nomadic ways.<br />As a child Hogan had a miniature teepee, a fast horse, and a medicine necklace of green beads; she learned traditional arts and food gathering from her mother and experienced the bitterness of Indian boarding school. She grew up to be a complex, hard-working Native woman who drove a car, maintained a bank account, and read the local English paper but spoke Crow as her first language, practiced beadwork, tanned hides, honored clan relatives in generous giveaways, and often visited the last of the old chiefs and berdaches with her family. She married in the traditional Crow way and was a proud member of the Tobacco and Sacred Pipe societies but was also a devoted Christian who helped establish the Church of God on her reservation.<br />Warm, funny, heartbreaking, and filled with information on Crow life, Hogan&#x2019;s story was told to her daughter, Mardell Hogan Plainfeather, and to Barbara Loeb, a scholar and longtime friend of the family who recorded her words, staying true to Hogan&#x2019;s expressive speaking rhythms with its echoes of traditional Crow storytelling. Barbara Loeb taught Native art history at Oregon State University. She is the author of<i>Felice Lucero-Giaccardo: A Contemporary Pueblo Painter</i> and numerous writings on Crow and Plateau Indian art and culture. Mardell Hogan Plainfeather is the daughter of Lillian Bullshows Hogan. She is retired as a supervisory park ranger with the National Park Service and as a Crow field director of the American Indian Tribal Histories Project at the Western Heritage Center in Billings, Montana.